UrbanFoodPlus has teamed up with the RUAF Foundation (www.ruaf.org) and local partner organisations to develop and facilitate multi-stakeholder platforms in our research cities that bring together not only researchers, and farmers but also all relevant ministries, and city authorities that are relevant to the institutionalization and improvement of urban and peri-urban agriculture, contributing to resilient cities. These platforms allow to introduce our research to those most clearly impacted by it. They also aim to create ownership, cultivate a dialogue among the relevant parties, and involve them from the very beginning in the research process. We follow the multi-stakeholder platform and action-planning process developed by RUAF. This process moves from situation and stakeholder analysis through the platform meetings and the development of a City Strategic Agenda to processes of implementation and monitoring. UrbanFoodPlus functions as an initiator of this process: one of the major achievements is to get relevant stakeholders to discuss with each other and to develop an interest in moving urban agriculture forward. This local uptake is a decisive step towards the project’s aim to make urban agriculture more efficient and beneficial to the urban residents and the cities as a whole. 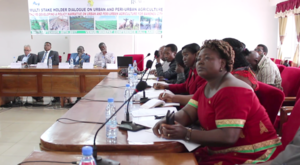 An important input to the platform is a policy narrative, which is developed together with local partners such as UrbaNet and UDS in Ghana and SHUMAS in Cameroon, that provides information on the situation and constraints of urban and peri-urban agriculture and it’s opportunities but also includes plans for action. The platform will facilitate the development of a City Agenda on UPA that continues even beyond the scope of this project.